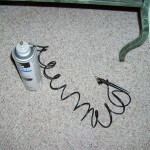 Airbrushing on the cheap. Not. So my coworker B.C. 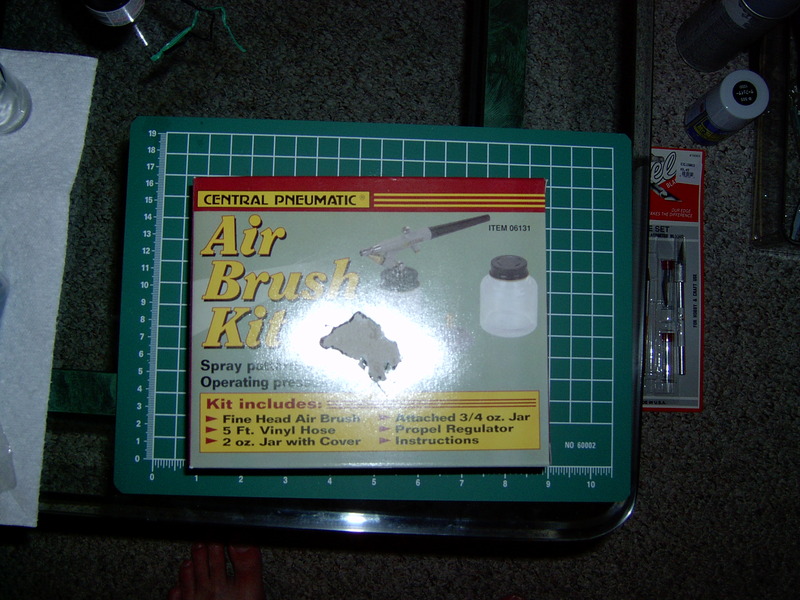 was nice enough to give me a pair of air brushes he found on ebay for $5. Yes, $5. Neither one of us had our hopes up that high. Honestly I think his woman just wanted them out of the closet. It was especially fun when I found a post about them on the Internet that says their lifespan is usually measured in days. That was an optimistic assumption I believe. 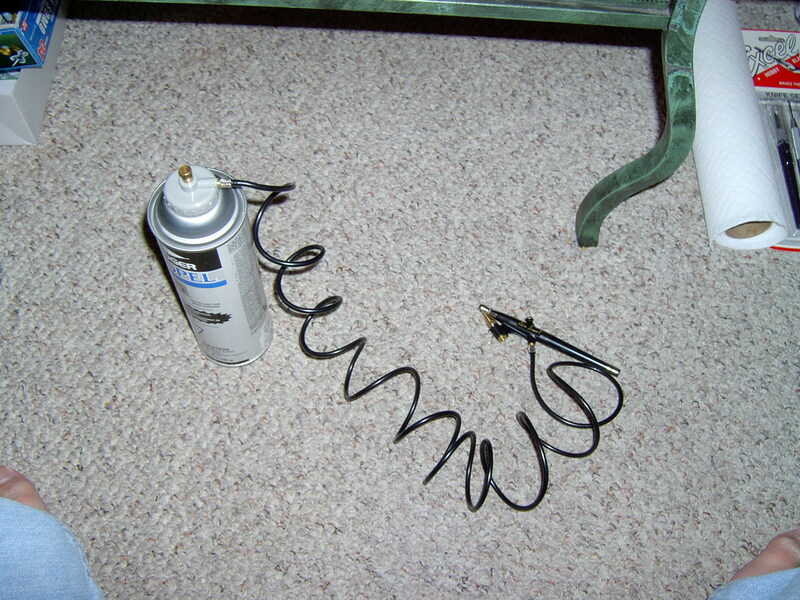 Anyway, I got some paint, and air can, thinner, etc, and hooked it up. Gamera and I were having fun with Skype (if you can call two guys watching each other build gundams “fun”) and he suggested I put the air can in hot water. Apparently this helps air flow. Apparently too much as the hose escaped it’s threads and wizzed around my head and legs until I managed to shut off the air. Using a trusty clamp, i solved that. I was however unprepared for the sheer inadequacy of this air brush to do it’s job. Gravity feed from the top is so much nicer as the bottom feed uses more paint, requires me to make more paint, and barely works at all in this case. The airflow was totally all over the place, and I couldn’t increase it or risk losing an eye from the hose. 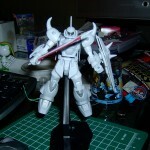 I managed to kinda whiten up about 6 pieces before I just gave up. I didn’t bother cleaning the brush since I’m going to keep the satisfaction of throwing it away so it can’t cause anyone elses hopes to be dashed against the rocks of crappyness. I’m going to save the other one to give to someone I don’t like and feel like discouraging. 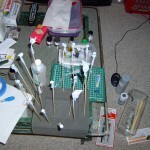 I had a bunch of pieces on skewers ready to go, heh, how silly of me. I have to wait a week of drying for the few pieces I did, against all odds, get paint onto. 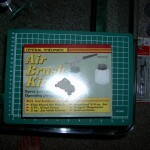 Maybe I can somehow get myself a real airbrush before then. The coating was horrible so maybe I’ll just strip them and try over. So the pieces that had the primer peeling off I threw in the simple green after sanding them down to clean off any oil from my skin. I learned today that Simple Green will EAT the primer. Was pretty cool. I wasn’t expecting that but useful to know. The pieces are fine so it doesn’t matter, I was going to reprime them anyway. Left them out to dry and hopefully I can spray them tomorrow. Gah! My primer isn’t sticking! 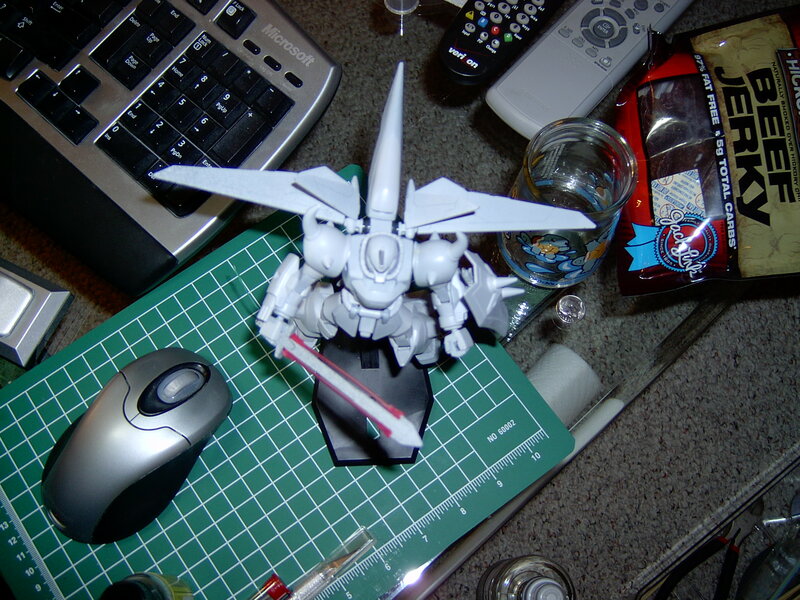 So I was chatting to GameraBaenre about my priming and such when I put some masking tape on a piece and then pulled it off. And was like….hrm…that part looks darker now. The primer came off! At first we thought perhaps it was just these two small pieces, because I had handled them a lot so maybe the oil from my fingers had gotten on them. 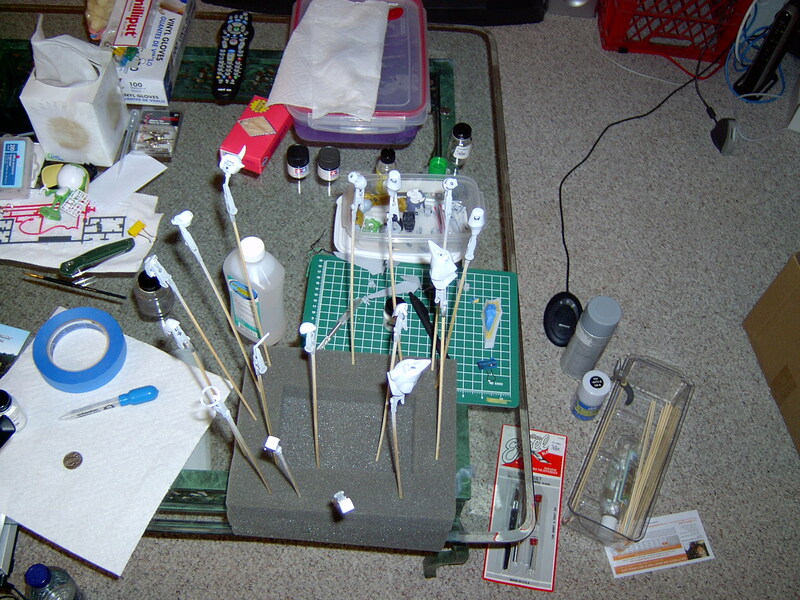 Most of the pieces I had soaked in Simple Green degreaser for just that reason. 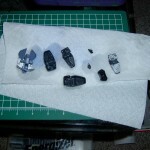 Turns out it’s all of the black pieces that didn’t require any sanding. 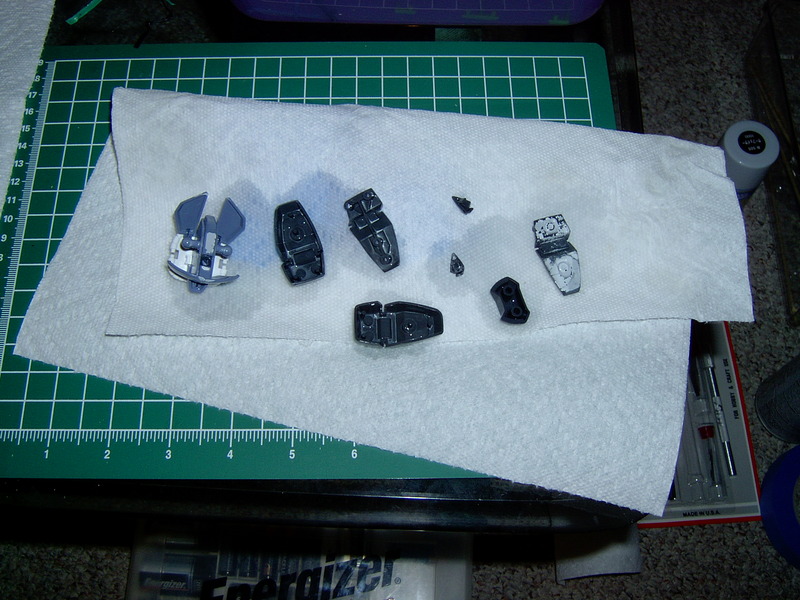 Apparently the black pieces are really really smooth, so the primer didn’t have anything to stick to. Luckily this was pretty much just the waist, feet, and chest piece. 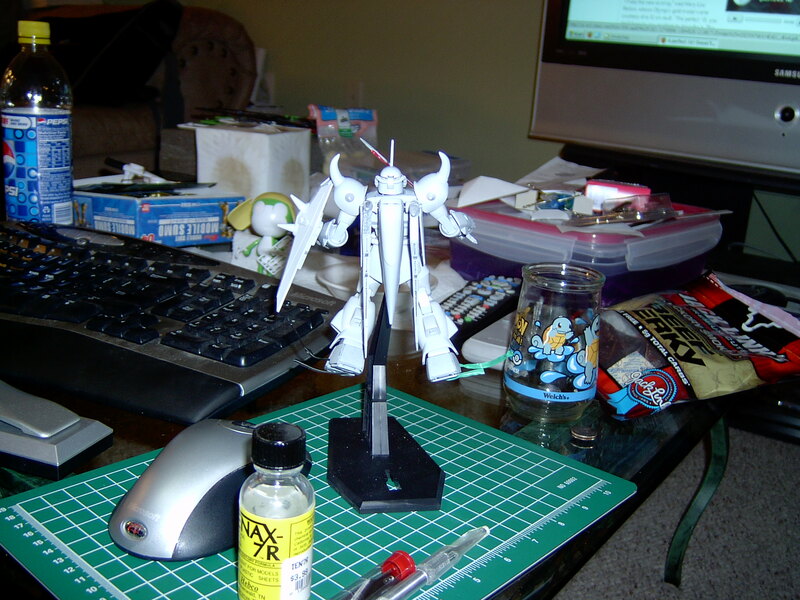 The wings I had done some sanding work on so those were fine. 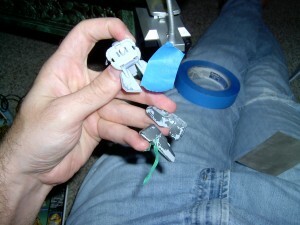 So I had to remove all the primer that wasn’t on well by sticking tape on the piece and ripping it off repeatedly until things stopped falling off. Sigh. Now I just have to sand those, and then re-prime them. 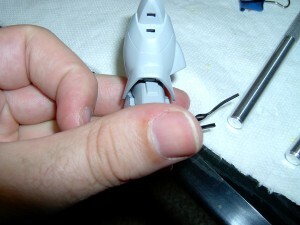 Gah, I sanded away my panel lines! 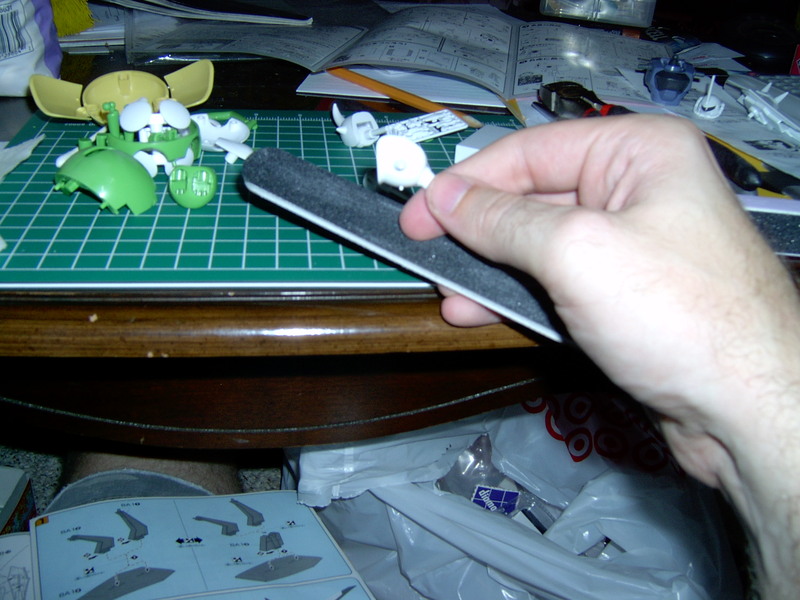 I had noticed this before but when I’m sanding away my seam lines, if those seams meet a panel line I end up sanding away the panel line too. This isn’t good. Those are SUPPOSED to be there. 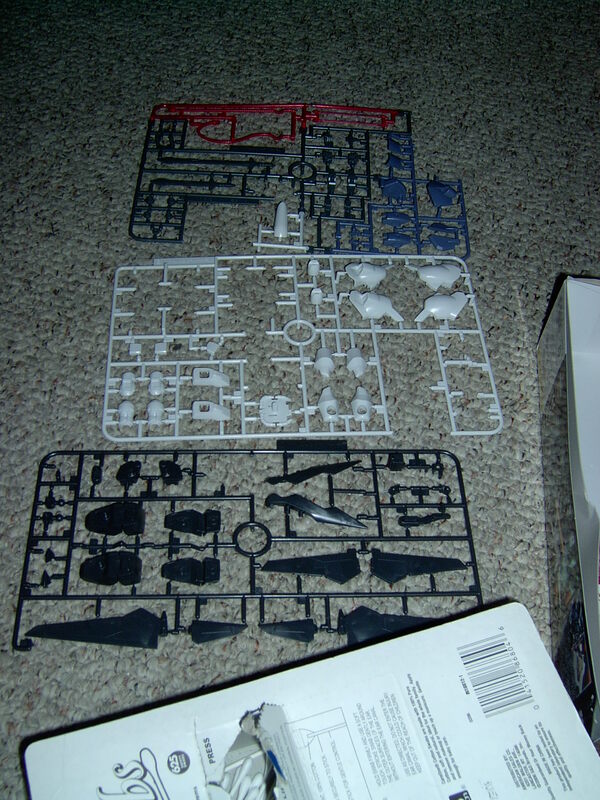 See how the panel line in the very center (which of course is super bright from the flash making it hard to see) is very faint, almost gone. So I went to the store and got a Excel brand Needle Point Hobby Awl for 2.99. (Also known as a scribing tool) The sales guy tried to get me to buy a 9.99 version but I mean really…it’s a sharp piece of metal. 2.99 is fine. I then used this to VERY CAREFULLY scrape the panel line into the plastic. GameraBaenre suggested I put a piece of tape on it to mark the line I wanted and scrape along the edge of the tape. This just made me uncomfortable so I just did it by starting at the edges and working my way in till they met (again, very very faintly). Once I had a straight line going across then I kept working over it until it was deeper and more visible. 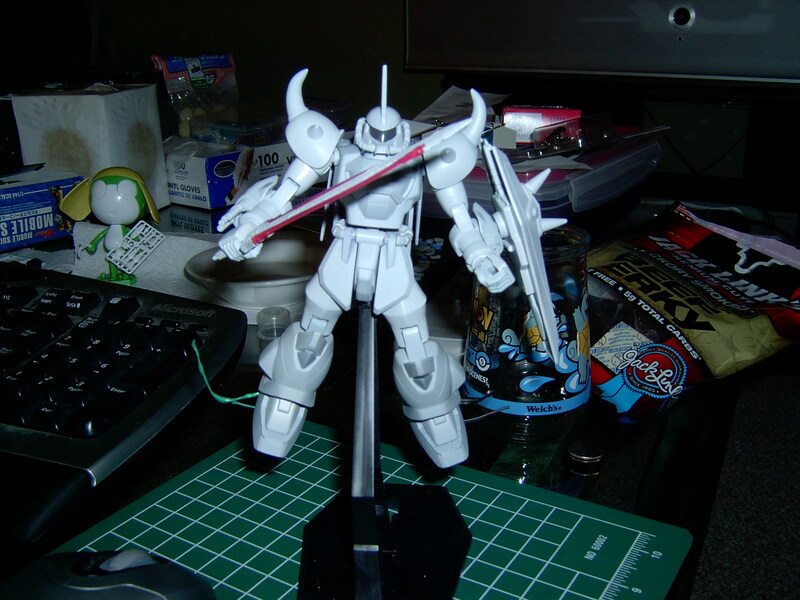 I bought this model at the same time as my Keroro, at Anime Expo 2008. 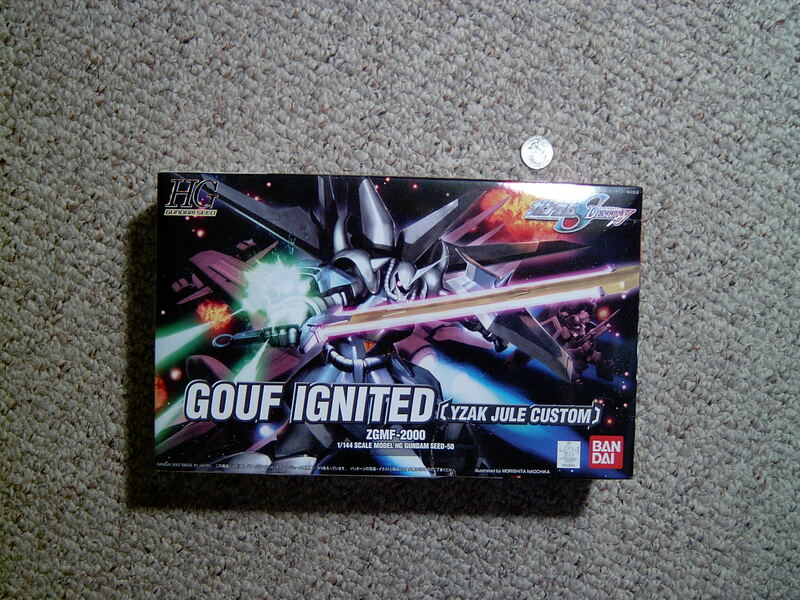 I got this to try to finish before Otakon 2008. It was going to be a surprise for my friend GameraBaenre who has been trying to get me to start model for a while (and bought the Keroro). 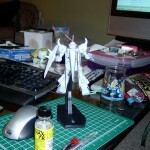 I only managed to get it primed before Otakon however. Oh well, I can enter it into the contest next year. 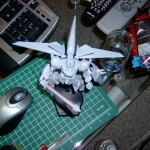 Assuming I get an airbrush before then. 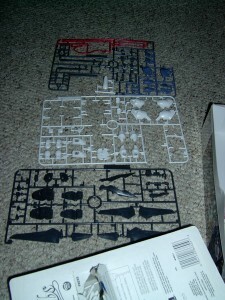 Here’s the part tree minus a few pieces I had already started working on before I remembered to snap a picture. I did all the normal sanding, and removed all my seams. The parts fit nicely but had some challenges so this was a good kit for a beginner like myself. 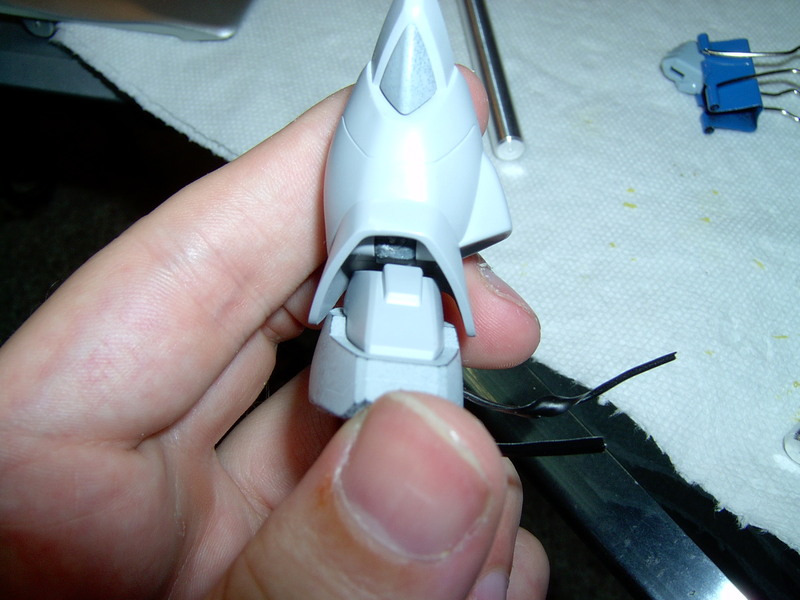 I primed it all up after sanding and here’s some shots of it all put together. I was pretty happy with it 🙂 Gamera was impressed with my seam work for what was my first real model. 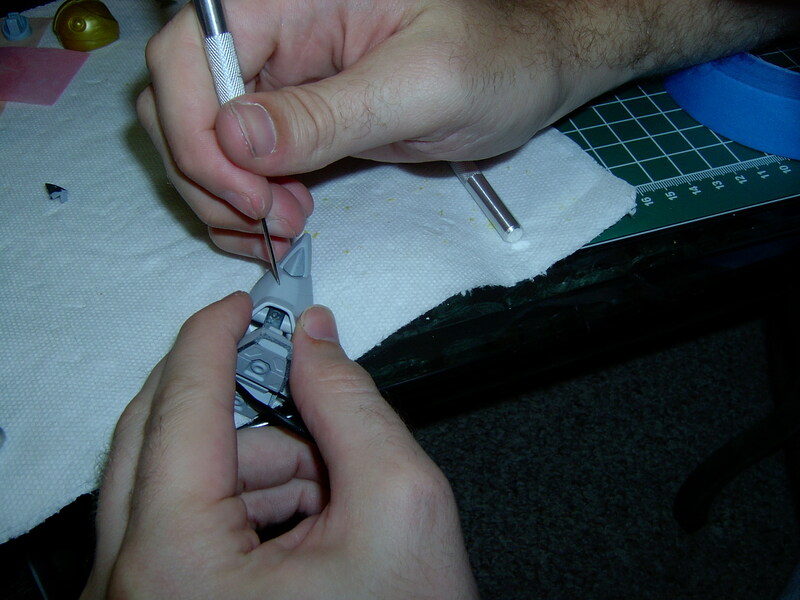 I credit it completely to his model building tutorials. I really wish I had taken more pictures. I had some really tricky issues that I fixed like when I spilled a bunch of Tenax all over a piece and ended up with a gooey mess. Or the wrists that were round when I started, and kinda squarish when I was finished sanding. 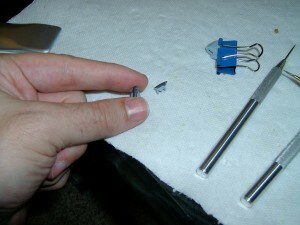 I had to fix these with some milliputt putty. Oh well, I’m sure I’ll mess up again and I can document those things better next time.